For those of you that require a Sylvanian Starter House with a little more space, Copperbeech Lodge has two large rooms, one on each floor and also comes with furniture and one figure to get you started. 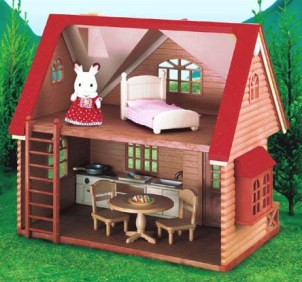 This starter pack includes Chocolate rabbit sister, bed with bedding, kitchen units and a table & chairs. A working light can be added to the ground floor using item Home Interiors Set. Includes rabbit sister Freya Chocolate.